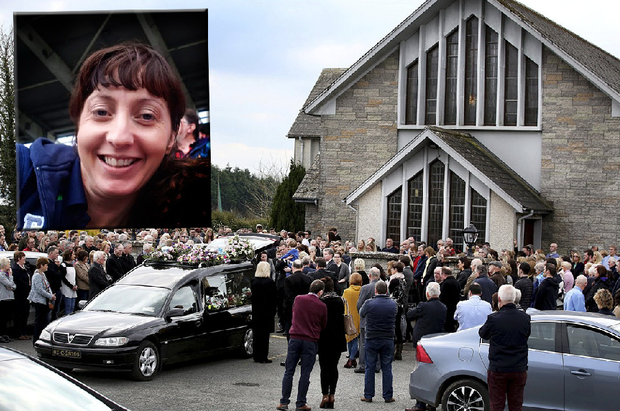 Heartbreaking scenes marked the funeral of Limerick mother Marie Downey (36), who was buried with her newborn son Darragh cradled in her arms. Hundreds attended the Requiem Mass of Mrs Downey and little Darragh at St Michael’s Church in Ballyagran on the Limerick-Cork border. Mrs Downey nee Cullinane was brought up in the GAA-obsessed Limerick parish – and lived with her husband, Kieran, and two older sons, James and Sean, in nearby Knockanevin, outside Kildorrery. Her husband, Kieran, received an ovation from the packed congregation as he fought back tears to pay an emotional tribute to his late wife and baby son. “Marie was a beautiful person inside and out,” he said. “She had a heart of gold. She always put us first. “Herself and Darragh are our special angels now. “Our first dance at our wedding was to ‘We Have Only Just Begun’ – and we had only just begun. We love you Marie and Darragh,” he sobbed. 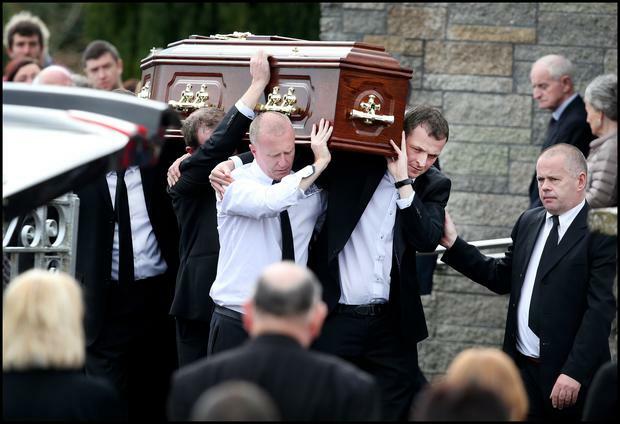 Tragic scenes marked the funeral where Mr Downey carried his two sons, James and Sean, into the church behind the single coffin containing his wife and Darragh, who was only born last week. The couple’s eldest son, James, brought three colourful teddy bears to the altar as a symbols of the family’s love and unity – and his mother’s devotion to her children. The Offertory Gifts reflected the deep loves of Mrs Downey’s life. 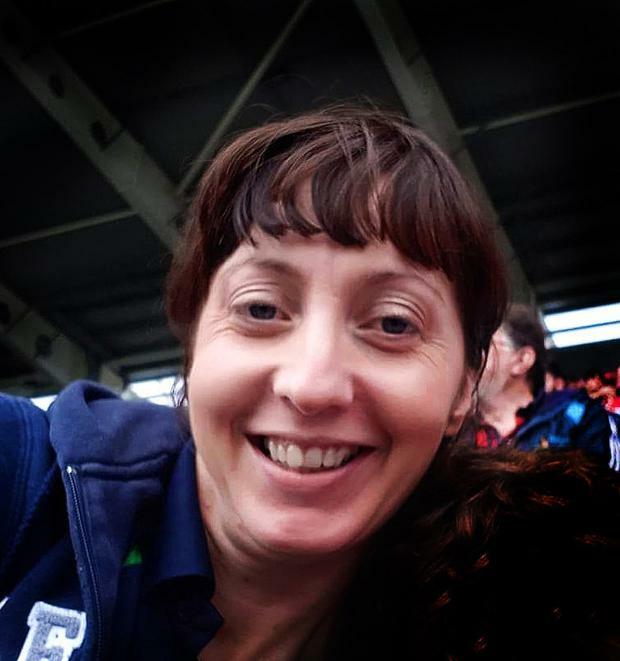 The mother of three adored sports – and four GAA jerseys from Ballyagran, Kildorrery, Douglas and Limerick were brought to the altar. Ballyagran GAA club provided a special guard of honour outside the church. Also offered was a photo taken last Saturday in Cork University Maternity Hospital (CUMH) when little Darragh met his two big brothers for the first time. A handbag was brought to the altar to reflect Mrs Downey’s lifelong love of shopping. Mourners were told that tears of joy at the birth of little Darragh on Friday evening had turned to tears of anguish, pain and despair by Monday morning when Mrs Downey was found unconscious on the floor of her room in CUMH. She was found lying unresponsive on the floor of a single room in CUMH shortly before 8am last Monday. Tragically, little Darragh – whom she had apparently been breastfeeding – was discovered partially trapped underneath his mother on the floor. Mrs Downey could not be revived and was pronounced dead on Monday morning. Darragh, who suffered critical injuries, lost his brave 36 hour battle for life on Tuesday evening. An independent review into the double tragedy has now been ordered by Health Minister Simon Harris, while a review is also underway by the South-South West Hospital Group of which CUMH is part. Post mortem examinations were conducted on both Mrs Downey and her infant last week. The results, including the findings of specialist toxicology and neurological tests, will be compiled for an inquest to be held next year by Cork Coroner Philip Comyn. One of the theories being examined is that Mrs Downey, who was checked by hospital staff shortly after 7am, suddenly fell ill and attempted to get out of bed to raise the alarm or reach the bathroom. She apparently then fell unconscious and slumped onto the floor, with Darragh being accidentally trapped underneath her. Mrs Downey had apparently wanted to go home on Sunday but agreed to stay at CUMH to give her time for further rest and recuperation. Just two weeks ago, she had proudly brought her two boys to Kildorrery national school to see the Liam McCarthy Cup won last year by Limerick’s All Ireland hurlers. Also amongst the mourners were her parents, Jim and Helen Cullinane, extended family members, staff from pharmaceutical giant, Novartis, where Mrs Downey worked as a laboratory technician, as well as Teagasc where her husband’s family have strong connections. Councillor Jerome Scanlan, a friend of Mrs Downey’s Limerick family, said the entire community was shocked by what happened. Novartis said the thoughts and prayers of all Mrs Downey’s colleagues are with her family. “Marie Downey was a valued member of our team here at Novartis, Ringaskiddy. Our thoughts and prayers are with Marie’s family and friends during this very difficult time. Marie will be fondly remembered here at Novartis Ringaskiddy,” a spokesperson said. In Kildorrery, not far from the Downey’s home in Knockanevin, Parish Priest Fr Eamon Kelleher said everyone was shocked by the tragic death of the mother and baby. “It is an awful tragedy for the parish particularly for the people out in Knockanevin,” he said.